Cardio and strength training work together to give you the best results. 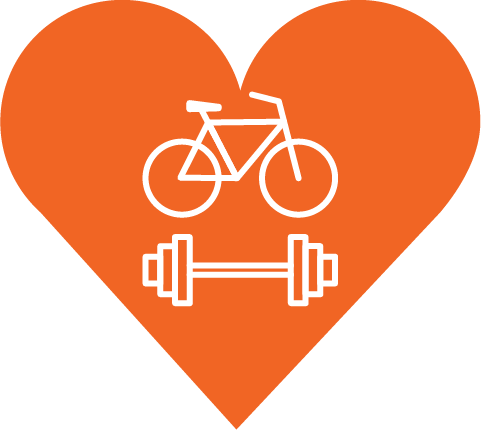 Get in the best shape of your life with RYDE and LYFT. RYDE is 45 minutes of cycling featuring fun and challenging choreography to the beat of the music. Each class features challenges in the form of speed, resistance and movement. Hand weights are included to give you a full body workout. Each instructor has their own music taste and choreography so you never do the same workout twice! Wear SPD cycling shoes, borrow ours free, or use your own athletic shoes. LYFT is a 60- minute bootcamp class that takes place off of the bike. You'll do a circuit of strength and toning exercises followed by short cardio intervals. You'll see equipment like TRX, Kettlebells, and dumbbells and we'll do things like deadlifts, squats, planks, and push ups. Classes are conducted in small groups so you'll feel like you're getting personal training, but you're paying less than a quarter of the price!